The features you want. The quality you need. Quality and consistency should not be compromised. The BK-Medent Double Pin System gives laboratories all the benefits of a two pin system while maintaining an easy-to-use pinning procedure and a cost effective price. Our double pin system boasts a compact profile and tapered design that makes accurate positioning easy. The narrow profile is ideal for proper preparation, even when space is limited. Stable die placement made easy. BK-Medent Double Pins require only one drill hole per die. Pins glide evenly in and out of the sleeves due to a short friction zone. 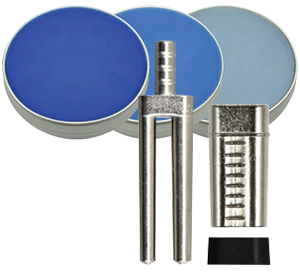 Zero abrasion of the base stone erases the chance of die movement and asymmetrical pins eliminate reverse placement of dies. Our double pin system can be used with any standard pin drill. Check out how BK-Medent offers a double pin system that is both unique and superior to other pins. With BK-Medent, our end caps are packaged loose – not in a sheet.